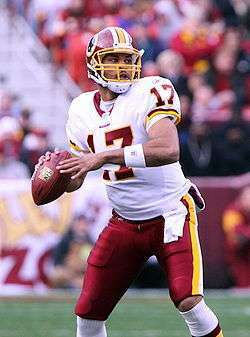 This is a list of American football quarterbacks who have started for the Washington Redskins, and if its predecessors the Boston Braves (1932) and Boston Redskins (1933–1936), in the National Football League (NFL). The Washington Redskins franchise was founded in Boston, Massachusetts as the Boston Braves, named after the local baseball franchise. The name was changed the following year to the Redskins. In 1937, the franchise moved to Washington, D.C.
Of the 49 Redskins starting quarterbacks, two have been inducted into the Pro Football Hall of Fame: Sammy Baugh and Sonny Jurgensen. 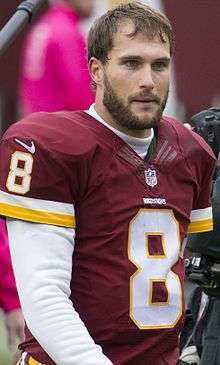 These quarterbacks have started for the National Football League's Washington Redskins. They are listed in order of the date of each player's first start at quarterback for the Redskins. ↑ "History: History by Decades". Washington Redskins. Archived from the original on 2008-08-04. Retrieved 2008-09-15. ↑ "Washington Redskins (1937-present)". Sportsecyclopedia. Retrieved 2008-09-15. ↑ "Hall of Famers by Franchise". Pro Football Hall of Fame. Archived from the original on 2008-08-22. Retrieved 2008-09-15. 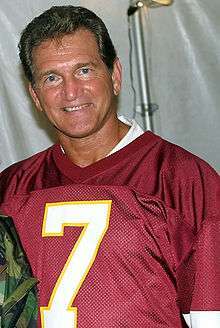 "Washington Redskins Franchise Encyclopedia". Pro Football Reference. Sports Reference LLC. Retrieved 2011-05-09.